This game can be adapted to ANY CONTENT! 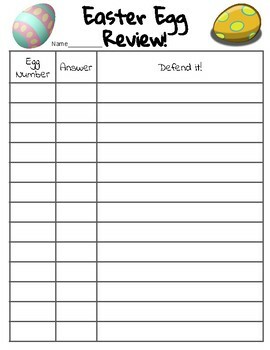 Simply print one or both of the pages, stuff some eggs with questions, and turn your students loose either outside or in your room (wherever you decide to hide your eggs)! I used this in my 7th grade science class as a review right before state testing. I had 26 questions, printed off two sets, and stuffed the eggs with one question each. This can take as much or as little time as you want. 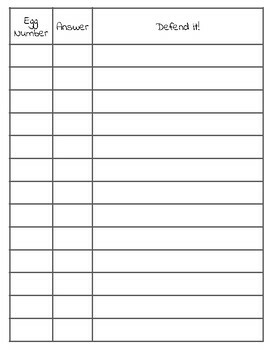 This sheet has enough room for 26 questions, but you could do less.